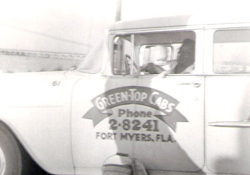 In 1947 at the time when Fort Myers was linked to Tampa and Miami only by two lane US 41, Tamiami Trail, and to Sanibel by only a ferry boat, Carlie and Jerry Young purchased Green Top Cab company to service the local clients and incoming visitors. National Airlines was the only airlines serving Page Field and the Ft. Myers / Naples area growth was in its infancy. In 1960, they purchased Yellow Cab company and continued expanding and growing and by the mid 1960’s were the first company to offer passenger van service. 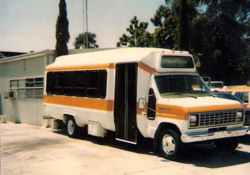 In the early 70's, the company filed for and was awarded an airport limousine and charter authority from the Florida PSC. During that time they were also awarded the first airport taxi franchise for Page Field where they remained until RSW was completed in 1980. 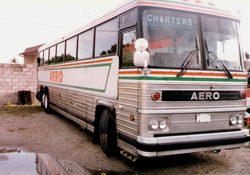 By the late 70’s Carlie and Jerry began to operate transit and mini buses and in 1985 formed Aero Bus Charters and added full size motorcoaches with interstate authority. 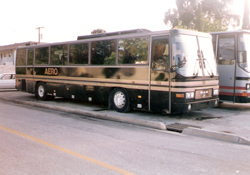 By the late 80”s the company was the first in Southwest Florida to operate an entire fleet of European MAN luxury coaches. In 2000, we relocated to our current facility. In 2002, all taxi operations where sold and our name was changed to America Charters. Today, Carlie and son Wayne still own and manage the company with a staff of professionals to maintain the same level of service that the customers have come to expect for over 62 years. America Charters professionals take personal pride in our relationships with meeting planners and their staff, as well as individual clients, to ensure that your transportation needs are exceeded. Whenever your convention or meeting transportation requirements include Naples, Marco Island, Sanibel Island, Ft. Myers, or out of state, remember America Charters is THE PREFERRED full-service transportation company.